Well, another year has come and gone without me having traveled anywhere of note. For the first time in my post-college life, I will end the calendar year with almost three weeks of unused vacation days. I had better check with Human Resources to make sure they will roll over into 2017; I know that days accrued this year will roll over, but I still have days that I earned last year, too! I hope, early in 2017, to visit some place warmer than East Tennessee, where the high for today is 37. I have friends in both Nicaragua – a country I have never visited – and Mexico – a country I lived in for almost two years. In addition to those places, I am also Jonesing to visit Cuba, sooner rather than later…and certainly before Donald Trump presumably sends our country’s burgeoning relationship with post-Castro Cuba back to the Stone Age. Ugh. What do Nicaragua, Mexico, and Cuba have in common? Warm weather! Historically, I have enjoyed spending the holidays in such snowy climes as Stockholm and Copenhagen, but it’s been almost four years since I last set foot on a tropical beach. Here, in continuing my blog tradition of sharing my favorite holiday season travel memories, is one such story…and a tropical one at that. 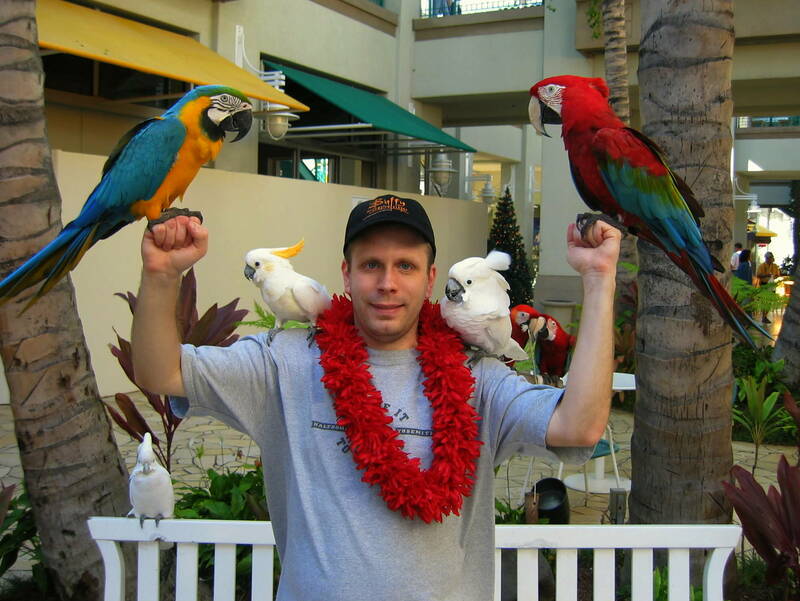 I lived in Los Angeles for 12 years, and decided in 2005 to take advantage of the frequent flight options from LAX to HNL (Honolulu International Airport). Because of the time difference, a noon flight from LAX would arrive in HNL at 3:30 p.m., while a “red eye” return flight would leave HNL after 10 p.m. and arrive in LAX by 6 a.m….meaning I could even make it to work on time on the day of my return! Service on United Airlines was fair. Although passengers didn’t receive a lei upon arrival at the airport, the pilot held a “halfway to Hawaii” contest during which passengers got to guess the exact time – with the correct time zone – that the plane would be exactly halfway between LAX and HNL. I was not a math major in college, and suffice to say, I didn’t guess correctly. But the guava juice, served only on mainland-Hawaii flights, more than made up for the fact that I didn’t win. Public buses ferry passengers from HNL to the hotel strip in Waikiki. 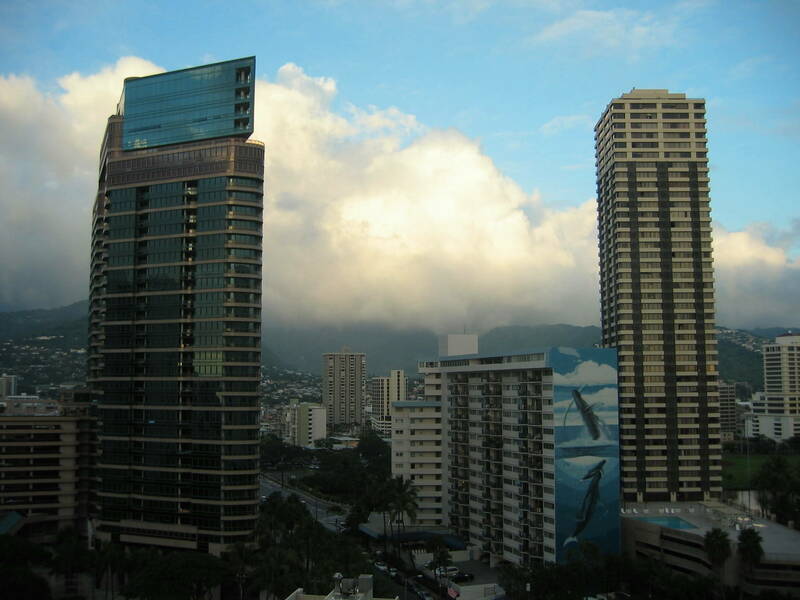 I stayed at the Doubletree Alana Waikiki, and my room offered views not of the ocean but of inland Honolulu. Notice the mural of killer whales in the photo below, part of a series of similar murals – “Whaling Walls,” by environmental artist Robert Wyland – that dot U.S. cities all along the Pacific coast. My first order of business was to stretch my legs. 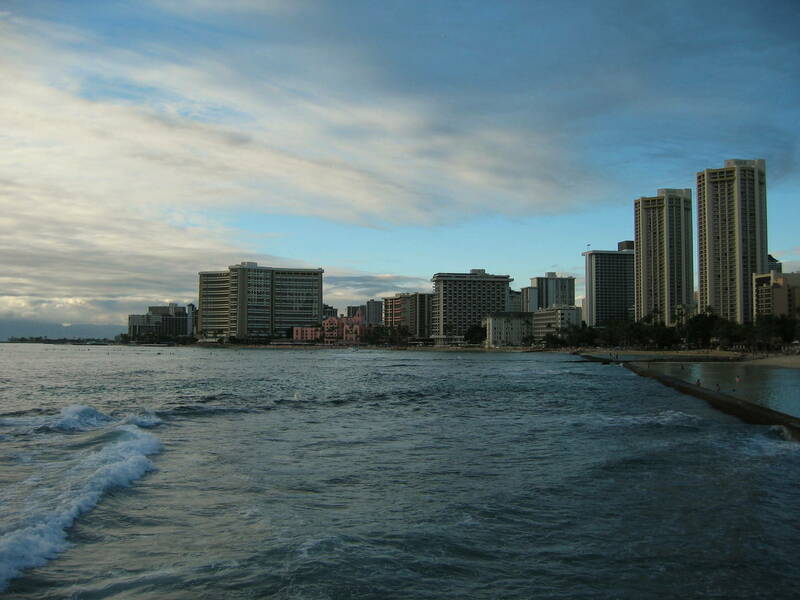 Kalakaua Avenue, which extends eastward to proper Waikiki Beach, is the touristic main drag and the “Rodeo Drive” of Honolulu. What appeared along the south side of the street to be a green space, dotted with palm trees, was actually Fort DeRussy Military Reservation. A holdout since World War II, perhaps? 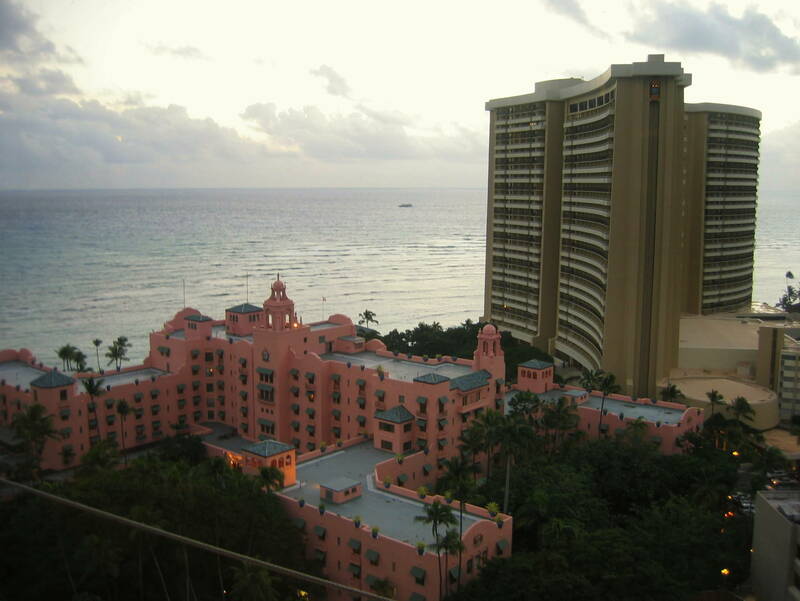 As the shoreline curves north, Kalakaua Avenue eventually passes directly in front of such landmarks as the classy (though pink) Royal Hawaiian Hotel and the Sheraton Waikiki. These hotels are pictured below (photo taken from an observation desk across the street), and I can wholeheartedly recommend the Sheraton’s patio as the perfect place to enjoy live music, sip a mai tai, or simply listen to the waves lap against the shore. I went to bed early and woke up the following morning – Thanksgiving Day – in full tourist mode. My goal was to visit downtown Honolulu, and I was pleased to learn that the bus stop near my hotel was for a route that passed directly through downtown. My first stop that day: Iolani Palace. Hawaii is the only U.S. state to have a royal palace, and its state rooms are open to tourists six days a week from 9 a.m. to 4 p.m. (closed Sundays and on select holidays). The former residence of King Kamehameha III and Queen Lili’uokalani, it was built in 1879 for the rulers of the Kingdom of Hawaii, and briefly functioned as such. 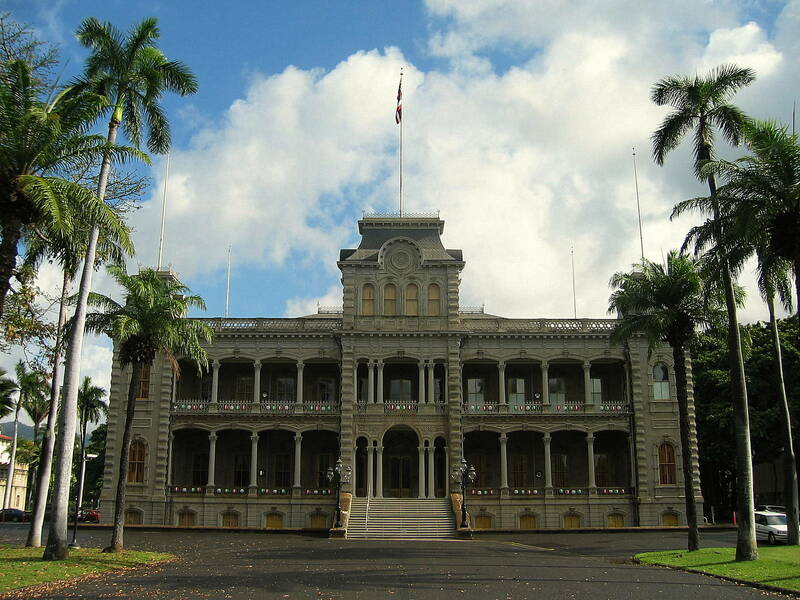 In 1893, the monarchy was overthrown and Iolani Palace doubled as the provisional capitol building, until the monstrous eyesore that now functions as the capitol was erected immediately behind the palace in 1969. I enjoyed an unexpected holiday music concert on the green in front of Iolani Palace – yes, it featured a hula dancer – and then continued my self-guided tour of greater downtown. 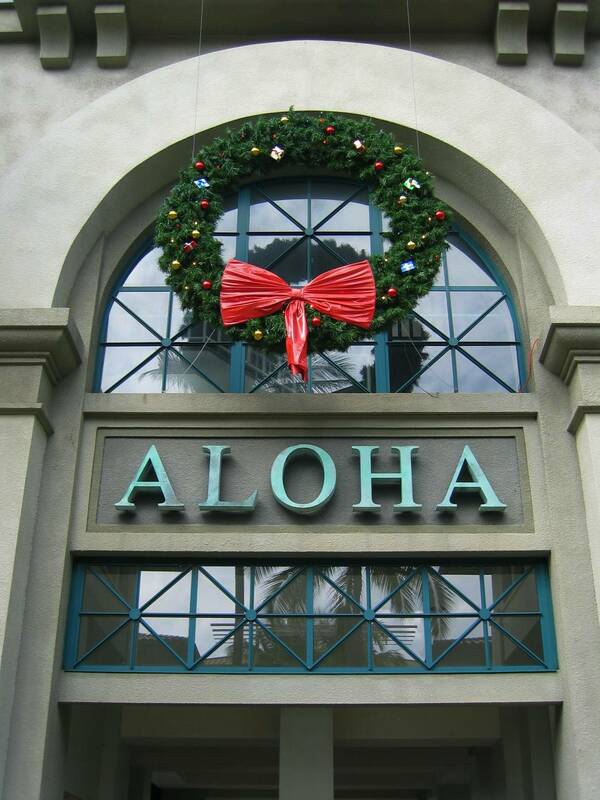 I first walked to Aloha Tower Marketplace, an open-air shopping mall near the cruise ship harbor. As it was Thanksgiving, the mall was all but deserted, although I was still able to part with some hard-earned greenbacks for the photo op below. Honolulu has a vibrant Chinatown, and my stroll through downtown, past pedestrianized Fort Street, eventually led me there. 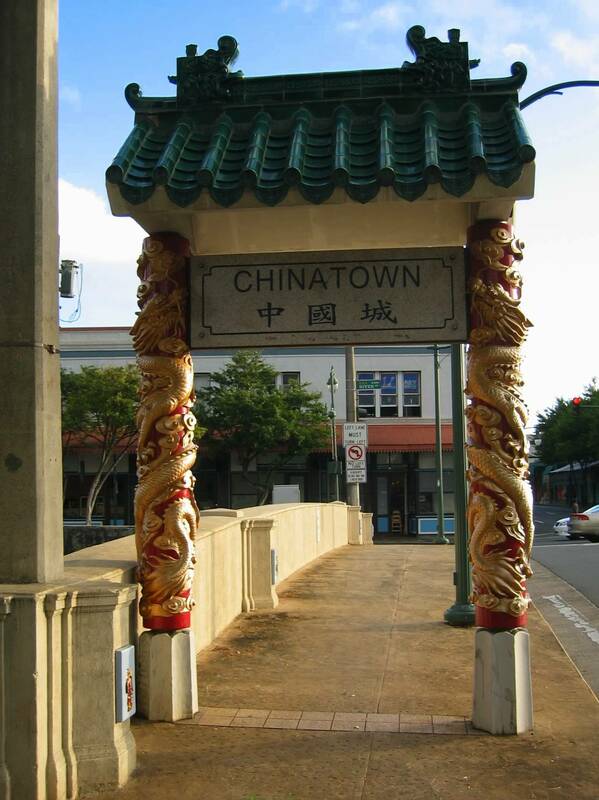 It is said that every Chinatown around the world features a traditional red gate; Honolulu’s was the smallest I have ever seen. Its red trim seemed to fit the holiday spirit. I enjoyed my walking tour through downtown Honolulu, although the experience would have been better had I gone on an actual workday; it was deserted during my visit. It started raining as I left the restaurant, so I ducked into a camera store to buy a replacement battery. 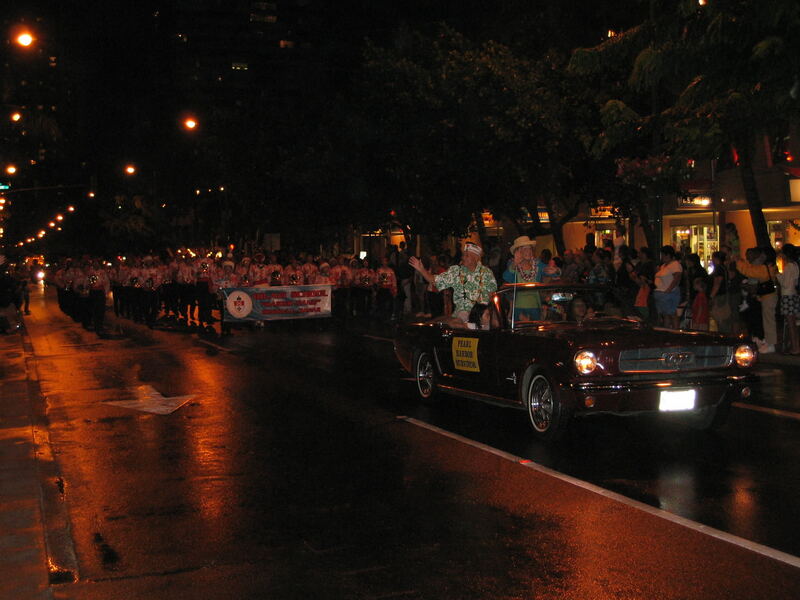 The rain didn’t last long, and it was followed up by a holiday parade down Kalakaua Avenue. Santa Claus brought up the rear, and he was proceeded by countless high school marching bands (at least one of which was staying at my hotel, its members running up and down the hallway at all hours of the night). More noteworthy were the dozens of Pearl Harbor veterans, wearing Hawaiian shirts and waving to the crowd from the back seats of the convertibles in which they rode. It was overcast when I woke up the following morning, but I knew what I wanted to do: rent a car and circumnavigate the island. Hilton Hawaiian Village, a mini-city in itself, housed a Hertz rental agency. The car wasn’t the convertible that you may have hoped for; it was merely some white Chevy/Ford/Kia something-or-other. The price was right and rain was in the forecast anyway, so I was fine with it. I headed out into Black Friday traffic, nothing too daunting for this former Angeleno, but heavier than I had expected. As I headed north, out of the city and into the lush countryside, the first point of interest that I passed, but didn’t stop off at, was the Dole Pineapple Plantation. My sights were set on Waimea Beach, supposed home of the biggest winter swells in the world. ou may be more familiar with the surfer-dubbed name “The Banzai Pipeline.” The ocean seemed calm that day, and dozens of surfers were seen effortlessly paddling into the waves. Still, the wind was blowing something fierce, and “no swimming” signs were prominent along the entirety of the beach. I continued my drive towards the northern tip of the island. Sunset Beach, another popular spot for surfers, was home to “shark’s teeth” – a series of jagged rock formations between the highway and the ocean. The road cut inland as I neared the northernmost point, turned east and then south, for the return trip to Honolulu. I stopped for a photo of the Polynesian Cultural Center, situated in the community of La’ie. The center, which turns 50 this year, features a themed village, a luau (pig roast), and live entertainment, all spread across 42 acres owned, somewhat curiously, by the Church of Latter-Day Saints. Admission is steep; of the eight packages to choose from, the cheapest is $59.95 for adults and does not include the luau. Suffice to say, I gave the Polynesian Cultural Center a miss, and felt that a single photo of the entrance would suffice. I continued my drive, now heading south along the Windward Coast. 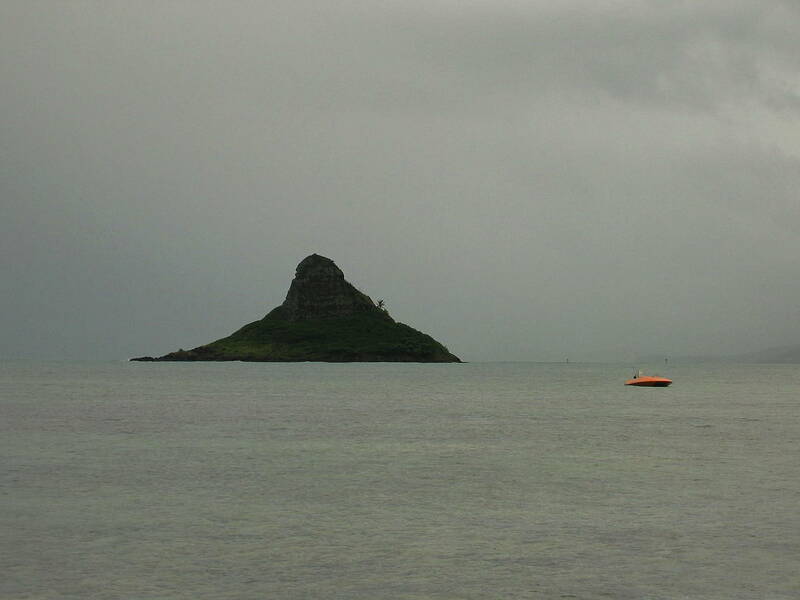 I pulled over for a moment to snap the photo below of Chinaman’s Hat, a picture-perfect island with a racist-sounding name. The water was almost clear, and the wide sandbar suggested that I could have almost waded to the island. Next time, perhaps. I didn’t stop anymore between here and the Hilton car park, but I did marvel at fluted cliffs to my right. Was Jurassic Park filmed here, I wondered? I could imagine velociraptors running through the grassy fields in search of brontosaurus burgers. I took the first shortcut back to Waikiki, inadvertently skipping what was said to be the coolest site of them all: the Halona Blowhole, which – mind out of the gutter, Loyal Reader – is exactly what it sounds like. My third full day in Honolulu included a trip to the small, but well-kept Honolulu Zoo, and a hike to the wartime pillboxes atop Diamond Head Crater, that omnipresent volcano that features in almost every picture of Oahu. There isn’t much to say about my visit to the zoo, except that the animals seemed well-tended and that the enclosures were neither big nor small. 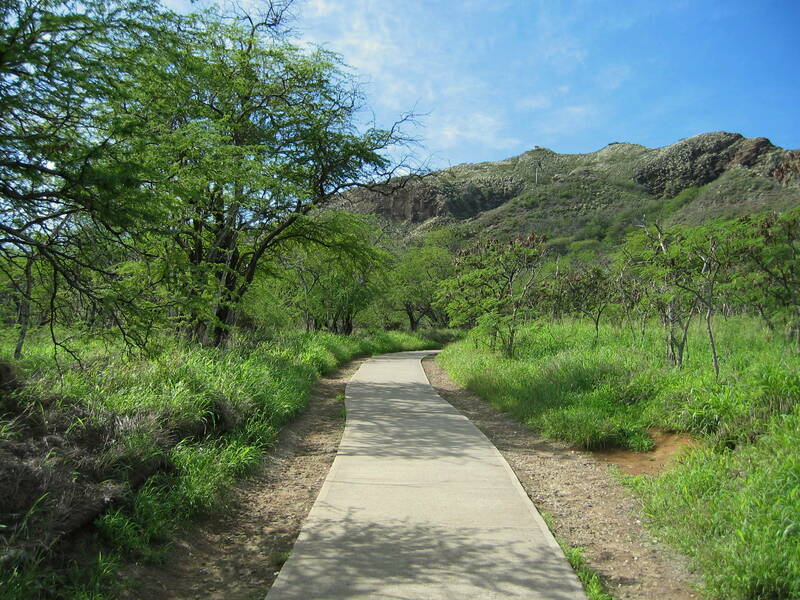 My Diamond Head hike, on the other hand, was the highlight of the trip. 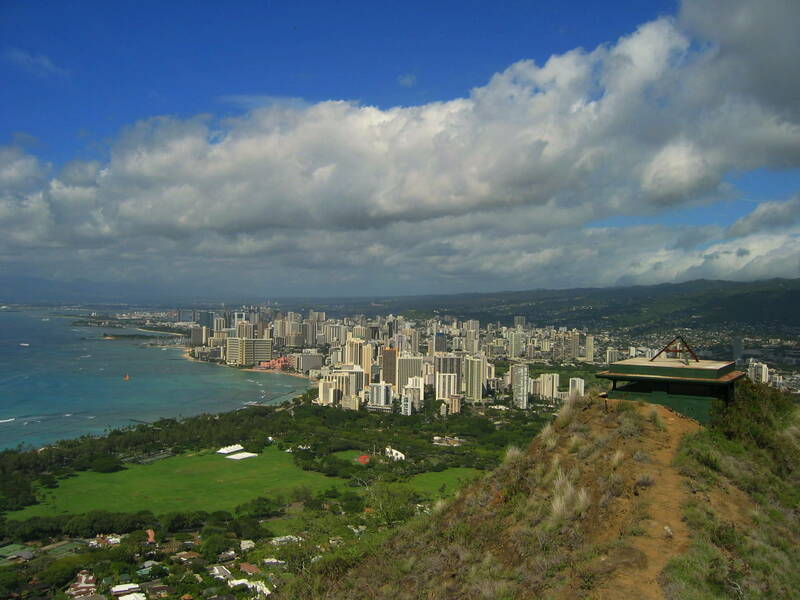 At 761 feet in elevation, Diamond Head is tall enough to dominate its surroundings yet short enough to be easily scaled. The 300,000-year-old volcanic crater looks different up close than it does from afar. I arrived at Diamond Head State Monument and was surprised to find a football field-sized, grassy crater floor. A paved trail winds its way towards the summit. At one point, I found myself in a tunnel, wishing I had brought more water as I climbed the final 99 steps. The summit vista, though, was worth the effort. Note the Omaha Beach-esque pillbox, used by the military as a lookout to protect Hawaii from foreign attack. By this point, I was knackered. (Okay, so “knackered” is mostly used to describe the exhausted state of sperm after racing towards the Fallopian tubes, but what other word would be more fitting?) 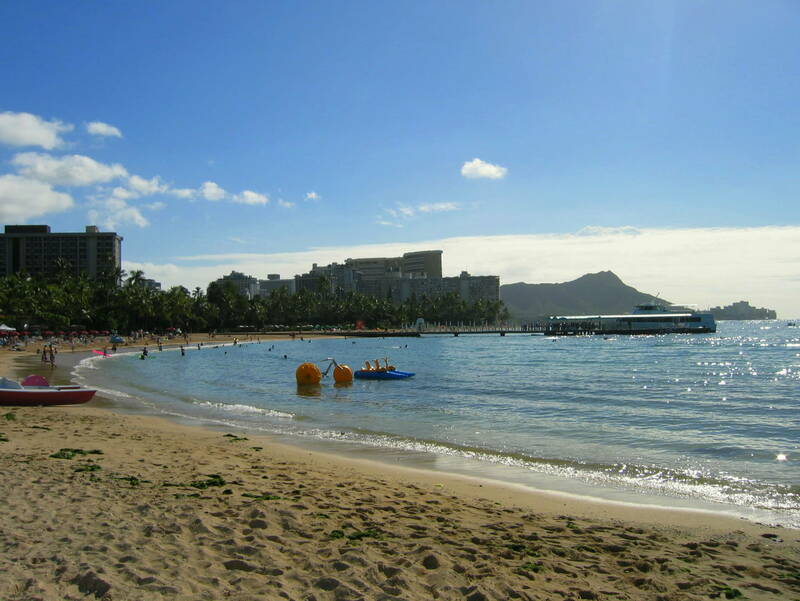 I hailed a taxi to Waikiki Beach and literally ran into the water, nimbly jumping over bodies and boldly ignoring any “No Swimming – Jellyfish Sighted” signs. I didn’t even change out of my street clothes! Plans for my last day in Hawaii were to visit Pearl Harbor, and meet a Honolulu-based coworker for lunch. Public buses plying Kalakaua Avenue eventually arrive at Pearl Harbor, but the ride is a long, slow that includes a stop at the airport en route. And it was Sunday, so the bus only ran once every 30 minutes. Suffice to say, I arrived at Pearl Harbor one hour later than planned, and knew that I might not make it to lunch. 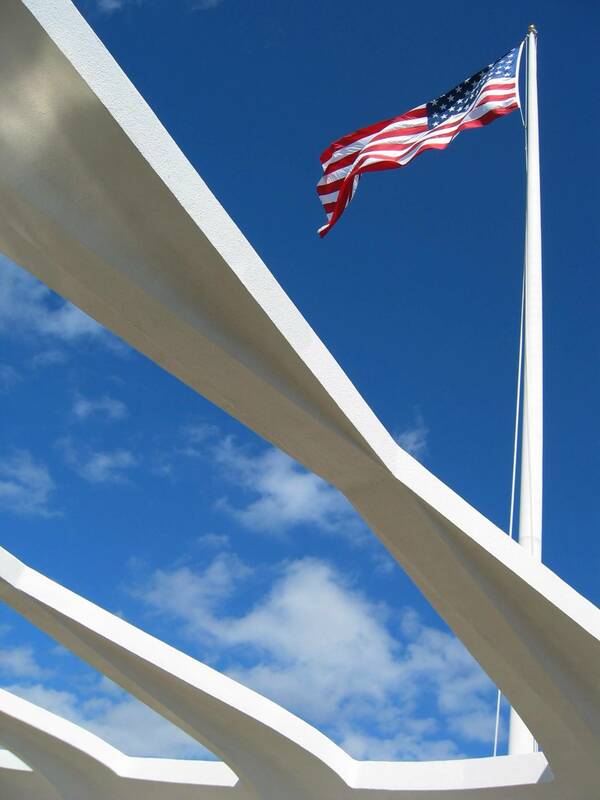 What can be said about Pearl Harbor, and the USS Arizona Memorial that hasn’t already been written? The Arizona, a Pennsylvania-class battleship, was sunken during a surprise attack by Japanese pilots on December 7, 1941. Over 1,100 U.S. soldiers perished in the attack, and the ship sunk almost immediately. Today, it rests on the ocean floor, a single smokestack poking out above the water as several gallons of oil leak out of the ship every day, staining the ocean like blood. The white bridge in the photo below straddles the ship, and an engraving on the bridge lists the name and rank of each sailor and Marine lost in the attack. 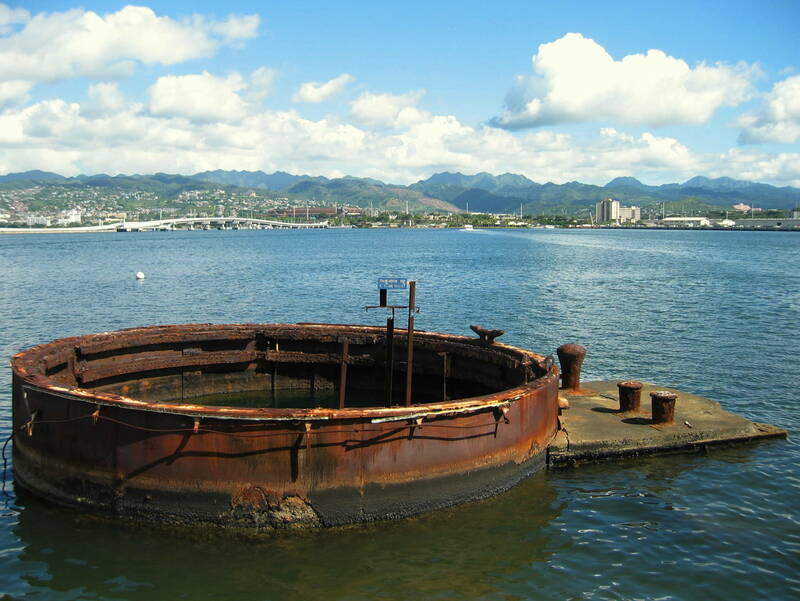 There is much to see at Pearl Harbor. You can climb aboard the USS Bowfin, a Balao-class submarine, or take a guided tour of the USS Missouri, an Iowa-class battleship. Movie buffs should note that the Missouri was featured in the 1992 film Under Siege, a movie that is quite good despite the fact that it starred Steven Seagal. There is a charge involved if you wish to tour the Missouri, but admission to the USS Arizona Memorial itself is free, and the site is part of the World War II Valor in the Pacific National Monument, dedicated by the National Park Service in 2010. Incidentally, earlier this week marked the 75th anniversary of the attack on Pearl Harbor. Sure enough, I missed my lunch appointment by a good hour. My coworker was amiable and understanding, and agreed to meet me in my hotel lobby later, for a pre-departure Mai Tai. We had never met before, and didn’t work closely together, but enjoyed some relaxed shop talk. I caught the last bus to the airport, well in time for my red eye return flight. One week later, I was busy working when a large care package arrived from my Honolulu colleague. Kona Coffee…macadamia nuts..Hawaiian chocolate…the works. She and I no longer keep in touch, but for the care package and the conversation I have just one thing to say: Mahalo. Sounds like a wonderful trip, yes? It was…but I came home with some interesting observations to accompany my sunburn. Hawaii is expensive. The airfare is, to be certain, but run-of-the-mill household items seem to cost a bit more, too. Toothpaste, bottled water, etc. Remember that everything must be imported, and that ain’t cheap. One thing that is cheap: pineapples. I grabbed a quick lunch at McDonald’s one afternoon (I know, I know…) and my Extra Value Meal, which was one dollar more than the same meal would cost in any of the contiguous United States, came with pineapples! Japanese tourists are obsessed with Honolulu. You may have read Time magazine articles about U.S. and Japanese Navy veterans, who once flew on opposite sides of history’s bloodiest war, forming incredible friendships. Two of the Pearl Harbor veterans in the holiday parade I mentioned several paragraphs ago were Japanese, and received as enthusiastic an applause as their American counterparts! But what surprised me was the number of Japanese tourists shopping along Kalakaua Avenue. Store employees stood outside the high-end shops that lined this street and specifically solicited Japanese tourists…while turning a blind eye to the likes of me. Indeed, for a time, I felt as if I was in Okinawa as opposed to Oahu. Honolulu in November, 2005, was my first of two trips to Hawaii. 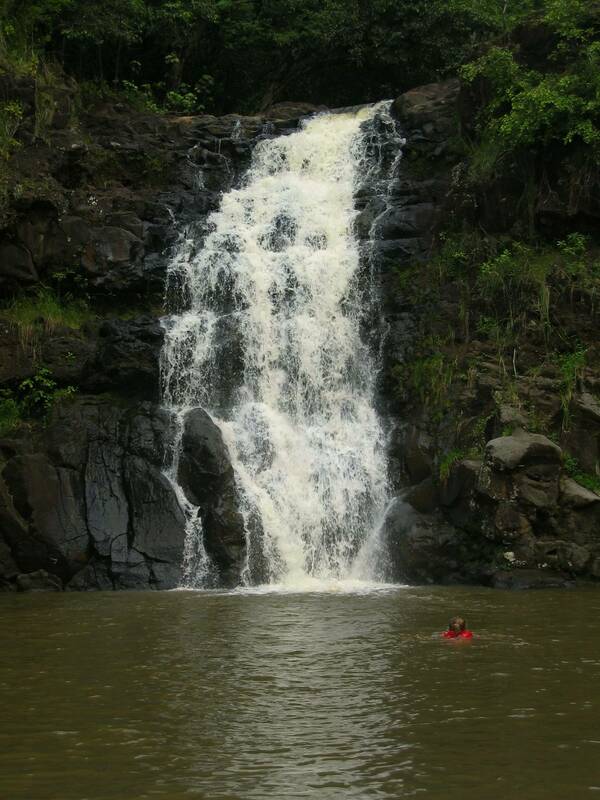 (I also visited Maui in May, 2007.) I traveled solo both times. My advice to you: don’t do this. Honolulu had a fair share of families on vacation together, but everyone else comprised the “couples on honeymoon” contingent. Maui was even worse. How do you enjoy lunch, alone, at a Hawaiian bistro when all around you are canoodling couples? Gag. I loved Hawaii, and I hope to return there many times over…but I won’t go alone.